NADS’ Self-Advocate Public Speakers Program is designed to train and support young adults with Down syndrome who have the desire to tell their story, share a message, and/or advocate for issues facing persons with disabilities. Our public speakers present at NADS events, in the community, and at fund-raising events. Some will present with other NADS public speakers at schools, organizations, and hospitals. Our young adult public speakers gather together on a regular basis to learn the art of public speaking, which includes learning how to write a speech, learning presentation skills, giving speeches to each other, and receiving constructive feedback. They support each other as they continue to enhance their public speaking skills. NADS recently launched a new Partnership Advocacy Council Program for adults with Down syndrome. 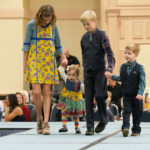 Though our Self-Advocate Public Speakers Program, through which we train and include adults with Down syndrome in our public awareness and educational outreach efforts, has been extremely successful, we wanted to find additional ways that individuals with Down syndrome can make an impact on our organization and to have a voice in what NADS is doing. 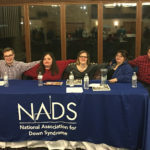 NADS Partnership Advocacy Council is a service leadership organization led by adults with Down syndrome and works in partnership with the NADS Board. The PAC focuses on service, leadership, outreach and advocacy. Self-advocates will participate in NADS activities, plan and run their own events, form committees, promote awareness, and work collaboratively with the National Association for Down Syndrome. The activities of our current self advocates will be integrated into the PAC. This new program will allow us to train additional speakers and will have activities for individuals who want to be involved in areas other than public speaking. All participants will expand their leadership skills to become caring leaders through service. This council is inclusive of all adults with Down syndrome (18 and older) who want to be involved. If you would like to find out more about either of these programs, please contact NADS.